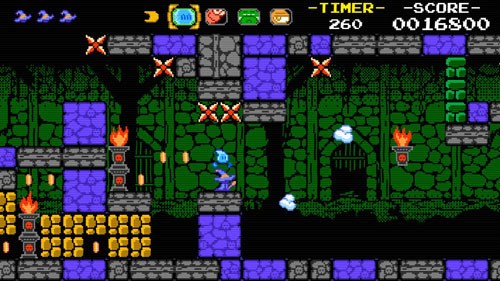 A game by Galope for PC, Mac, and Linux, originally released in 2019. Ravva and the Cyclops Curse is a sidescrolling platformer starring a young owl named Ravva. Ravva’s mother was a powerful summoner who could call forth creatures to do her bidding, but she found herself facing off against the Cyclops Lord who demanded that she give over her powers to him. She refused and the two did battle… but she lost. The cyclops stole her powers and turned her to stone. When Ravva finds her immobile mother, she vows to save her. Ravva studies up on magic and learns that her mother’s essence can be restored by defeating the cyclops and breaking her curse. She sets forth with summoned creatures of her own – which are cute and diminutive versions of those controlled by her mother – and travels toward the cyclops’ castle. 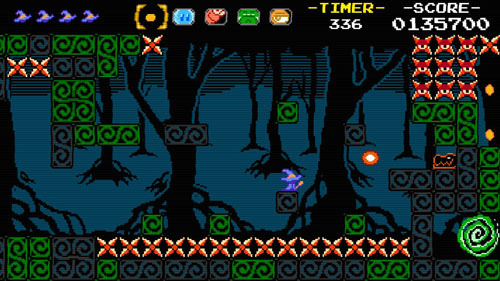 The player is able to play through a short tutorial stage or hop straight into the action. 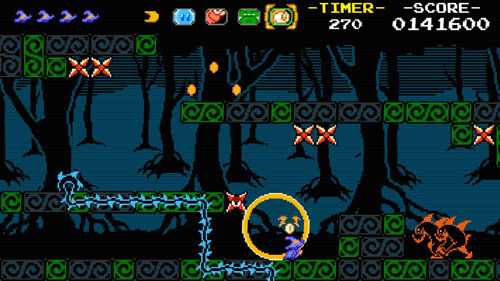 Gameplay takes place across 10 levels, two of which are dedicated boss levels, across three themed environments. The adventure begins in a lush green wooded area, which gives way to a dead forest at the foot of the mountains, and finally into the giant stone keep where the cyclops lives. Ravva’s personal abilities are very limited, as she can only perform a 2x nonvariable jump and fire off a stream of bullets that go all the way across the screen. Bullets may be fired as quickly as the player can press the button, and they are used to kill enemies, break yellow blocks, and blast hovering spheres that hold items or coins. Ravva is far from defenseless, however, as she controls four creatures that she can summon at will, each of which has different abilities that can be used for combat and traversal of the environment. 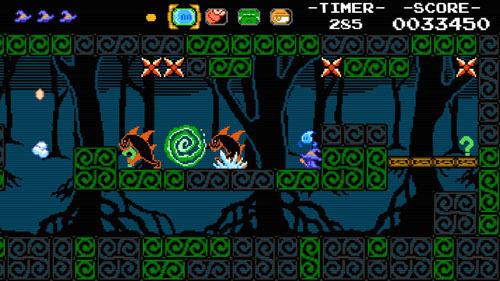 The player is able to cycle through each of the creatures, one at a time. Doing so deselects Ravva's projectile weapon, but most of the creatures have projectiles of their own. First off is a blue ice creature that fires spinning projectiles. Small enemies are killed instantly by these projectiles, whereas medium enemies become frozen and are slowed down, and tougher enemies are entirely immune. Freezing projectiles also pass through enemies and cause additional damage to enemy spawners. More importantly, the blue creature can freeze rows of spikes, which may then be destroyed by switching over to another weapon and blasting them, and later levels let you freeze torches and then use them as platforms. 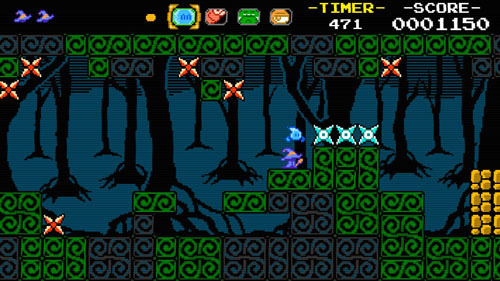 However, because the creature hovers slightly above Ravva, it can only freeze objects that are one block above her, leading to some spatial puzzles later in the game. Next is a red creature with horns where its eyes should be. This menacing monstrosity is capable of firing weak projectiles upward at an angle. This helps you deal with airborne enemies and also to break open secret blocks that drop coins (more on this in a bit). A green creature belches out powerful projectiles that fall downward and give off splash damage to hit enemies at a wide range. 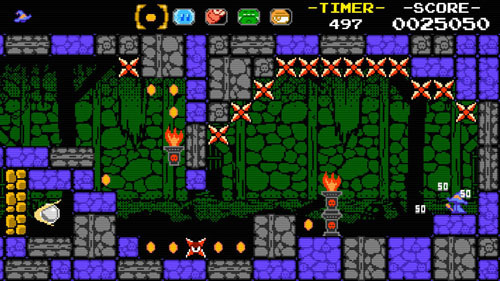 These projectiles can also be used to break green blocks and open pathways below the player’s position… sometimes leading to hidden treasure troves. Finally, there’s a flying eyeball with bat wings. Activating this creature’s ability causes a ring of yellow to expand outward from it, revealing nearby secrets. Secrets include destructible blocks, floating clouds that allow for spring jumps, or hovering orbs containing coins or powerups. It’s important to know that the game is positively packed with secret areas and hidden treasures, most of which are score items of varying denominations. Thorough players can find secrets every few paces… but there’s a timer in place as well, so spending too long hunting around will eventually cause players to run out of time and sacrifice a life. Score is a big factor here, with hidden caches coins rewarding exploration, bigger rewards for harder-to-find treasures, and a few treasures that require a bit of puzzle platforming to reach. 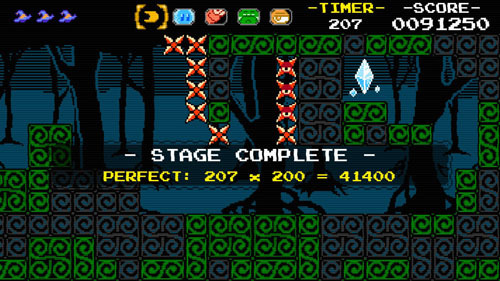 Time is also factors into scoring as the player is rewarded for completing the level quickly. 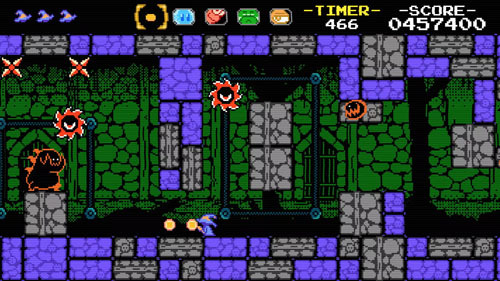 Bonus points are given for every second remaining on the clock, with a bigger per-second bonus given for making it to the end of the level without losing a life. You have a limited stock of lives, and there are 1UPs hidden here and there, but losing all of your lives sends you back to the start of the level with two lives and clears your score. Lives are not restored upon level completion, but players can stockpile lives and carry them over from one level to the next. 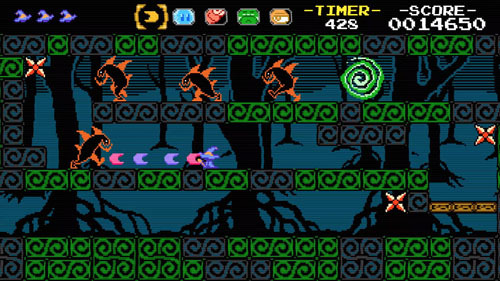 As such, players are encouraged to play through the game once and then return after they have mastered the levels in order to attempt a high score run. There’s even a secret ending for achieving a high score and making it to the end without dying, and a secret bonus room for people who meet certain conditions in one of the levels. That said, death is quite forgiving. Upon being killed, you respawn on the exact spot where you perished, and you have an incredibly long invincibility period. This allows you to dash past any dangers that might have been holding you back, and it also allows you to escape negative situations, such as finding yourself in the middle of a bed of spikes. 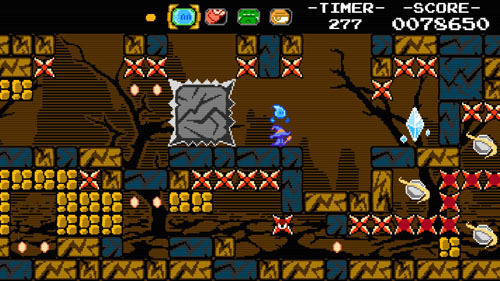 The game's challenge comes from equal parts platforming and enemy combat, with most exploration (via hidden destructible blocks) entirely optional. As such, simply completing the game is fairly easy, although a couple of the later levels may require multiple attempts. The game is designed so that it may be completed in a single sitting, with a first playthrough coming in at around two hours, but the player is free to leave the game and return if he wishes. Aiding the player are a couple of pickups that are found by destroying hovering orbs. These come in the form of 1UPs (represented by one of your witch hats), a stronger version of your basic projectiles that do more damage, and a shield that grants temporary invincibility against all enemies, projectiles, and spikes. Given that a lot of these items are hidden, you'll need to do some poking around to find them, but there are some environmental clues that help you figure out where to look… or you can just select the eyeball creature and mash the ATTACK button until you find everything the world has to offer. There are also 16 rainbow stars hidden throughout the game, which provide additional points. 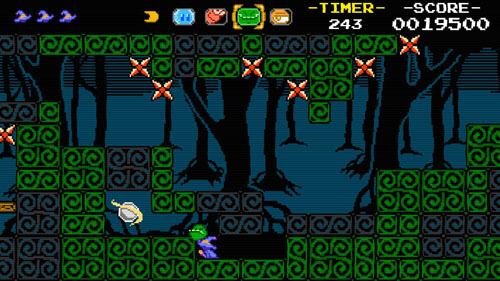 The game features a simple tileset that clearly separates traversable parts of the environment from the harmful ones, and enemy behaviors are generally apparent by their design, making the world easy to parse. The player is frequently confronted with enemies or obstacles that require him to cycle through his various abilities, although cycling occasionally makes it difficult to quickly switch to a specific creature to deal with an incoming enemy threat. There isn’t a tremendous variety in enemy types, but new foes are added in each area, and new challenge types appear every three levels. 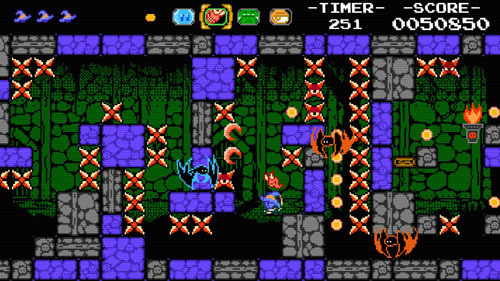 For instance, in World 1-3, the player makes it all the way to the end of the level only to find a red thorny vine blocking his path. 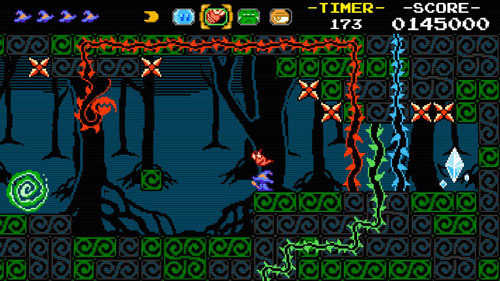 After defeating the vine creature with the corresponding red projectiles, the player must then venture back through most of the level to track down similar blue and green vines. 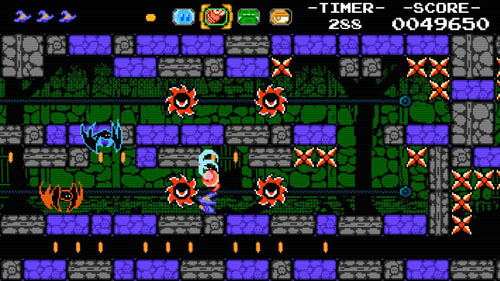 The game’s midpoint features a standalone miniboss encounter in an enclosed arena, and the final area features a considerable increase in the difficulty of environmental navigation. World 3-2 offers up some really persistent respawning bat creatures that will frustrate your attempts to make any kind of forward progress… at least until you figure out the trick for dealing with them. And World 3-3 punishes missteps by requiring the player to return to the start of the level. 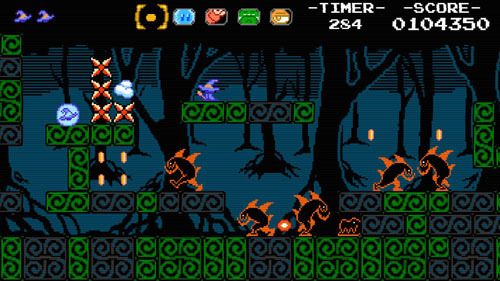 Aesthetically, the game offers simple 4-color sprites, and is accompanied by a chiptune soundtrack. 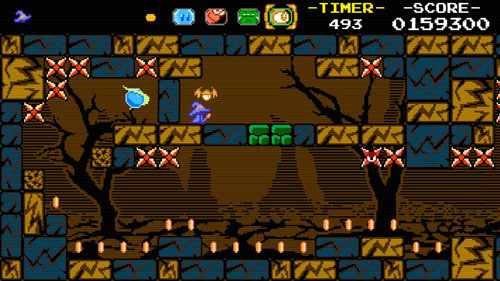 The player is free to choose between a few different screen filters, including scanlines, and the first two areas also feature a very distinct line art style for distant backgrounds. While the sprites and effects are generally in line with what was capable in the 8-bit era, animations have a few more frames than was typical of that era. This makes the player character and her enemies seem a bit more lively as they have little flourishes and a bit of spring to their steps, and the animations for the final screen-filling boss are very smooth. Ravva and the Cyclops Curse was developed by Galope under their Galope Minis banner. The studio is based in Brazil, and also worked to develop Meawja concurrently with this title, which is set in the same universe as Ravva and the Cyclops Curse. Esdras Lopes is credited with direction, programming, level design, and sound effects; and Gabrianne “Gabzero” Domingos is credited with art, animation, character design, and writing. Music for the game was composed by Grant Harper. The game was localized and published by The Hidden Levels, which is also the publisher for Galope’s Meawja, as well as The Void Rains Upon Her Heart from Veyeral Games.